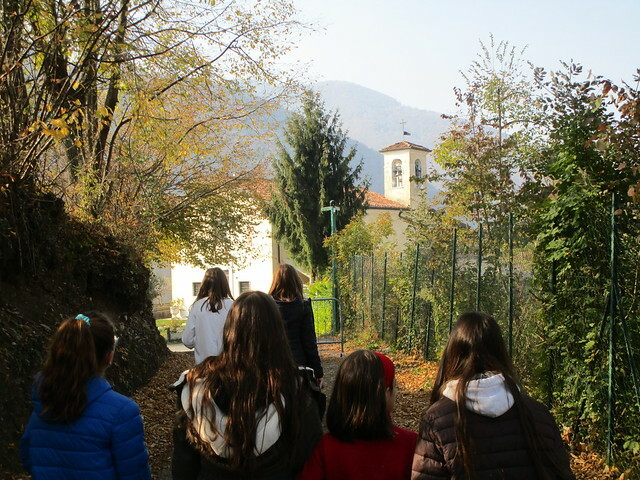 From October 31st until November 1st, the Servant Sisters in Lumezanne (Brescia, Italy) had a get-together for girls from the ages of 11-17. The theme of the retreat was “I am looking for love” and our goal was to console the Heart of Jesus which is so offended on the night of “Halloween”. The get-together started in the evening on October 31st. As the girls arrived they went to the kitchen right away to make chocolate chip cookies. While the cookies were in the oven, we had a meeting about the theme of the retreat “I am looking for love”. We explained how we are capable of consoling the Heart of Jesus and making reparation for the offenses he receives from mankind. We gave each girl a short prayer for them to repeat during the time of adoration that we would have later that night and during the next day. As a preparation for the Solemnity of All Saints Day, we divided the girls into groups and each group had to prepare a short skit about a saint and put it on for the rest of the girls the next day. After dinner there was time to practice songs for Adoration. The songs were very international: English, Italian, Spanish, etc. We took advantage of everything in order to console and adore Jesus in the Eucharist. Then it was time to go to the Chapel for the Holy Hour. We decorated the Chapel with cloth and candles and we also put a couple of different quotes. One of the quotes was right under the altar and it said, “Come to the foot of the altar and open up your heart, there you will receive all the consolations and graces that you need” (Our Lady to St. Catherine Laboure). We also put another quote beside a picture of Jesus looking out over Jerusalem that read, “As He drew near He saw the city and wept over it” (Lk. 19, 41). We started the Holy Hour with points of meditation talking about how each one of us looks for love and how Jesus is the same way. We mixed moments of vocal prayers and petitions with moments of silence and personal prayer and every once in a while we sang a song in between. One of the Sisters talked about how Jesus cried when He looked out over the city of Jerusalem. We reflected upon what it was that we have to change within us in order to be a consolation for Jesus. 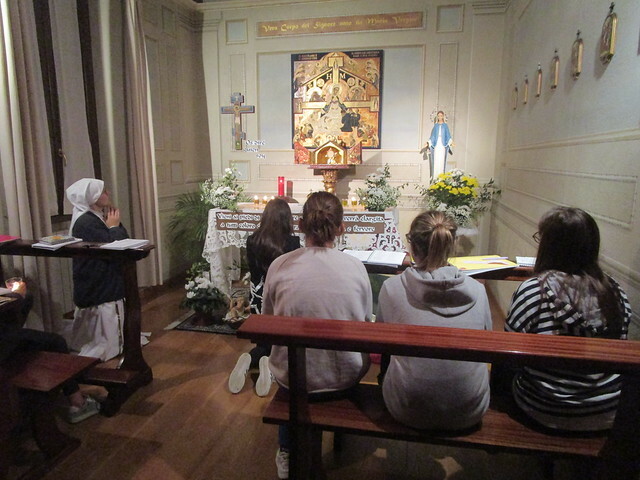 There was a moment of silence and then, while we sang songs, each girl knelt before the altar to put a candle and say before Jesus in the Eucharist their short prayer that we had given them and to make a special petition to our Lord. We ended the Holy Hour asking our Blessed Mother for help singing the Salve Regina. The next day, November 1st, after the Solemn Mass, we did a small hike while praying the rosary to the church of St. Margaret. There, we had time for prayer and points of meditation that continued on with the theme of consoling the Heart of Jesus. After Adoration we had time outside to play games. When we got home we ate lunch and after lunch each group had time to do their skits that they had prepared the night before about the saints. We hope that we were able to console the heart of Jesus in this weekend and that whenever the Lord looks upon each one of us He can say, “I was looking for someone to console me and I found someone”.